Above: For clever costumes and extremely impressive pumpkin carvings, head to Los Alamos. Photograph by Tira Howard. Come late October in Los Alamos, you can hardly swing a plastic skeleton without hitting a candy-coated event. Five days before a certain spooky holiday even arrives, I follow a woman carting a cow skull in a bucket. At least I think it’s a cow’s skull. We head to the downtown core. There, streets are roped off, and every merchant has a trick-or-treat stand mobbed by line after line of fairies, wolf boys, grim reapers, one Einstein, and quite a few Harry Potters—from children to people who might otherwise be categorized as adults. “It’s Mayberry on the Mesa,” says Ryn Herrmann, of the Los Alamos Commerce and Development Corporation. On October 31, one particular street has become so popular that police block it off and sometimes a marching band shows up, all thanks to a resident who hands out generous fistfuls of high-end chocolates. The trick to the treat is to find out who he is. To do that, you need to head to Los Alamos and start making friends with the right kinds of guys and ghouls. 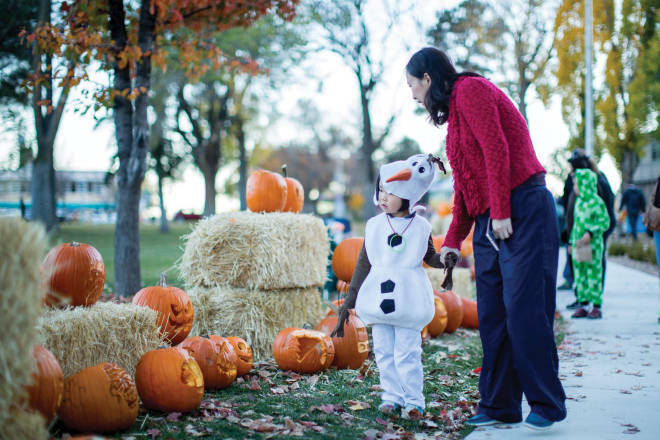 Trick-or-Treat on MainStreet, sponsored by the Los Alamos MainStreet program, will take place Friday, October 26, 4–6 p.m. Tackle the wall at the YMCA Costume Climb, 5–7 p.m., and scare the Skittles out of yourself at the Knights of Columbus haunted house, 6–10 p.m. on Friday and Saturday. On October 27, take in the Masquerade Recital at Fuller Lodge, 5–6 p.m., followed by the Pumpkin Glow on the lawn, 6–9 p.m. Shake your bones at a dance with live music, 6:30–9 p.m. All events are free.